Ever heard of Kirkland Coffee? Probably not. Not that many coffee lovers would know Kirkland is Costco’s in-house (or private-label) brand. It’s a brand name that you’ll find on a variety of products in its warehouse stores from clothes to cleaning products. If you’re interested in learning or buying other Costco Coffees just click to the relevant Costco Coffee page. This page is only about Kirkland & Kirkland Signature Coffee. You would usually expect a warehouse store brand of coffee to be made with poor quality coffee beans – not Arabica coffee beans; indeed, some less expensive well-known brands include cheaper beans – often using Robusta beans that are widely-regarded as inferior and used to make many instant coffees. However, don’t let this fact make you think the Costco coffee is inferior in any way, despite being sold as bulk coffee. Why? … At Costco’s, you’ll find that no less than 7 types of Kirkland coffee that are all surprisingly delicious and affordable, offering a smoother coffee, with better taste, and lower caffeine content. I’ve provided an overview of these great bags of coffee beans, and I reckon I’ve purchased all of them at least once! Kirkland produces a range of coffee beans products for the Costco marketplace including Kirkland House Blends, Kirkland Specialty Coffee, and their Kirkland Signature Series. So let’s take a closer look. I should say that I’ve tried most of these over the years, except the last item on the list below – but it’s next in my Costco shopping cart! When you look at the shelves for Coffee Beans, you’ll notice that there is a prominent display for their “House Blends”. These packages are now brightly colored: Red, Blue, and Green. All of these coffees are 100% high grade Arabica coffee beans. But what is little appreciated is that they are actually specially blended from Latin American coffees and are exclusively roasted by Starbucks Coffee Company. Though you will see the words “Custom Roasted” emblazoned on each pack, you are buying a reasonable coffee bean that makes a decent cup. First up: the Kirkland Signature Medium Roast House Blend Coffee is packaged in green. If you’re worried about your caffeine intake, then take a look at the blue pack which is the decaffeinated alternative: Kirkland Signature Medium Roast Decaf House Blend (a note on Decaffeinated Coffee). The Kirkland Signature Dark Roast Espresso Blend is easily spotted by its bright red packaging. All of the packs are labeled “Custom Roasted By Starbucks”, though none are identical to Starbucks own roasts, you’ll enjoy each of these roasts. The first thing you’ll notice when you open each package is an aroma that entices you to brew a cup right there and then! That the beans are actually custom roasted by Starbucks may put some people off, as many find that Starbucks darker roasts have an unpleasant burnt flavor, but Kirkland is surprisingly mild and smooth. It’s worth giving each of these a try. As you may know, Fair Trade coffee offers farmers a fair price for their labor and produce so that they can lift their families out of generations of hardship and poverty. For those interested in Fair Trade Coffee Beans, you’ll be glad to note that these coffees are all certified Fair Trade(pdf). It turns out that many Kirkland Signature Coffee Beans are actually prepared by this well known company, Rogers Family Co., in California. You can take a look at the site, but they do not offer any retail options for the Kirkland brands. Sorry! The Kirkland Signature Colombian Supremo Coffee is remarkably full bodied and smooth and is 100% Arabica beans. It is a medium dark roast with low acidity. This Kirkland Colombian Supremo Coffee is grown in the Andes Mountains of Columbia where the rich volcanic soil makes these beans superior in taste, aroma and acidity. When you brew a cup from this bag of Kirkland coffee, you’ll surely notice the aroma—slightly sweet with a barely-there overtone of sweet fruit. Although you’ll be tempted to grab it as soon as you can, wait until the brew is finished! Kirkland’s Columbian Supremo tastes fresh and clean, full bodied with a medium texture that is very pleasant. The finish hints at the fruit your nose detected in the aroma and is very pleasant. This coffee comes in beans as well as pre-ground bags and cans. I would, of course, recommend the whole coffee beans over ground coffees any day, to get the freshest flavored coffee in your cup. If you like Kirkland coffee beans, the next one may not be to your liking, though I enjoyed it. It’s the Kirkland Signature Rwandan Dark Roast ; it is a very dark roast that may not be to your liking, it certainly came over as excessively strong to my colleagues in the office when they tried it. I actually liked the overall character more than they did. And the aroma is pleasant enough, with a hint of buttery dark chocolate that carries over into the taste of the coffee once brewed. It has a medium body and just a slight bitterness. Drink it quickly, however, because as the cup cools the hint of chocolate slowly evaporates. It’s a strong, rugged coffee that should be drunk hot or not at all. 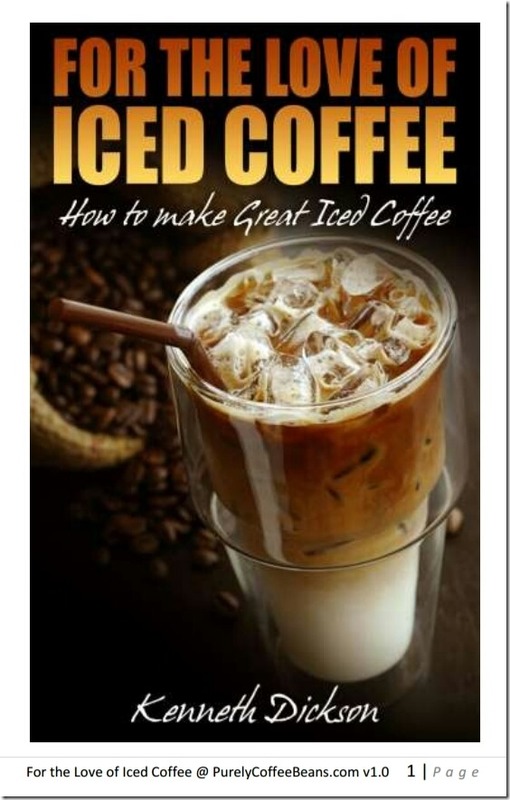 Therefore, if you are making ice coffee, you may want to look at other blends. Kirkland Signature Papua New Guinea Whole Bean Coffee (NB: this product may not be available currently) , on the other hand, is a delicious dark roast that has not had the flavorful oils burned off. Grown on the second largest island in the world in volcanic soil, this coffee is not at all bitter. It is rich and slightly smoky with a fruity finish. Though it’s dark roast coffee, unlike the Rwandan Coffee, it possesses a much lighter taste than you would otherwise expect. Phrases like “surprisingly light” and “delicate, almost sweet” come to mind when you’re drinking this. It even makes a terrific iced coffee. You will still want to drink this one even when you get to the end of the bag, unlike some of the more robust coffees. We recently tried the Kirkland Sumatra Coffee . This coffee was darkly roasted, and rather a bold coffee with a full, almost out-of-body, experience. One or two previous customers noted it for its rich aroma, roasted extra dark, and mellow taste. For those who prefer the dark roasts of Vienna blends, Full City roasts, etc, you will find this a good partner for your coffee pot. 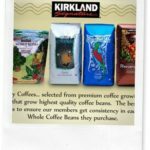 While you can find Kirkland coffee stocked at many Costco Stores, you can also find it at Kirkland’s Coffee on Amazon . So you can enjoy Kirkland Coffee delivered to your door! No Costco membership required! On a personal note, we are currently trying the Kirkland Signature Papua New Guinea Whole Bean Coffee 3 Pound Value Bag (NB: this product may not be available currently, Jan.2016 update) right now. I’m surprised how dark they have been roasted, and how much oil has been brought to the surface. Overall, though, it’s a better cup of coffee than the Rwandan Coffee. One customer, Gary Peterson wrote that he found the Kirkland Signature range of coffee beans to offer a terrific bargain that combined high quality ingredients at a substantially reduced cost. He compared one bag of Kirkland coffee to the equivalent Starbucks French Roast, and found that he saved nearly 50% of the cost, despite boasting that it had been custom roasted by none other than Starbucks Coffee Company themselves. Overall, he reckoned that while it didn’t quite have the roasting quality of the premium Starbucks product, he preferred it and he really appreciated the cost. I’ll be updating this page as I discover more coffees ( such as the KS Starbucks Ground Organic Blend Coffee Medium Roast Ground which we just started drinking recently ) on my regular monthly trips to the local Costco. This coffee is only intermittently available. I’m glad it returned to our local Costco store in 2011, as readers seem to enjoy it. Best to use it quickly otherwise the flavors dissipate. I’ve been purchasing Costco coffee for quite some time now, and I’ve noted that they also carried several other varieties of Coffee Beans from time to time, including: Starbucks French Roast, Starbucks Breakfast Blends, as well as First Colony, Blue Mountain blends, and several other types, all of these seem to be subject to availability. You can find out more at our other page. Elsewhere at PurelyCoffeeBeans, we’ve discussed the Costa Rica Coffee and Kirkland’s level of caffeine. If you can’t find what you are looking for here, visit the Costco website (coffee department). Then search for coffee beans there. However, I have found that they don’t always list all the Kirkland coffee there, though it is available in-store. CoffeeReview has also reviewed several of the Kirkland brands of coffee that are worth reading as a more technical analysis of the merits of these blends. Giving Kirkland coffee a go! We usually buy the 100% Kirkland Columbian coffee in a 3-pound can each time we shop at Costco. That sounds like a lot of coffee, but we go through it fairly quickly and I haven’t found it to go stale in the 3 weeks it takes us to get through it. In fact, I like the Kirkland coffee as well or better than any pre-ground coffee we’ve purchased. We occasionally will splurge and get some whole beans and roast them ourselves to add some variety, but for everyday affordable coffee I think this is the best. I could not agree more but they are saying it is a deleted item. Do you have any other info? If you have any other comments or experiences, drop it in a comment box below. I look forward to reading it!